Oh what a perfectly sweet card! When I saw that you posted on my reader I thought of how baby was so close! Good luck to you and a safe delivery! May baby be healthy! I pray that all goes fantastic! Tami told me that the gender is a surprise, isn't it fun? Can't wait to hear what it is! Oh and of course your card is fab, yellow is such fun! So cute! 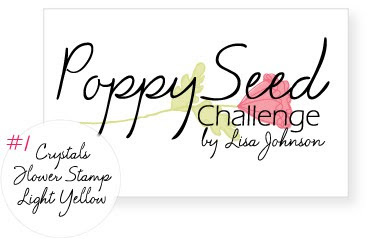 I love that flower stamp! Good luck with baby #3! Oh Kelly! I was thinking of you the other day and how close March was creeping up on us...so glad that you are in the final stages, yay!! Your card is beautiful - love the blossoms springing up like that! Good luck and keep us up-to-date! Wow! Can't believe baby #3 will be here in a few days! And you're still crafting? Amazing, Kelly! Best of luck and take good care! Love your card, too! Hugs!! congrats on baby #3! wishing you lots of sleep now before the arrival! Keep in mind that each time jailbreak will not offer you great outcomes. you are heading to require to do some button urgent!